1. Pick a patterned sheet from the First Edition Wild at Heart 6x6 Paper Pad, cut it down to fit the size of your bag, distress the edges and adhere to the centre of the bag with Dovecraft Perma Fix Tape. 2. Cut an 11cm x 11cm piece of coordinating Wild at Heart paper, distress the edges and stick it on your bag at a jaunty angle using Dovecraft Perma Fix tape. 3. Next, cut a 12cm x 1cm strip of complementing Wild at Heart paper. Place it on your cutting board horizontally. Measure along and score a vertical line at every 1cm. Fold your paper at each score line, back on itself. Follow this technique until you reach the last score line. 4. Glue this strip toward the top of the second layer on your bag. 5. 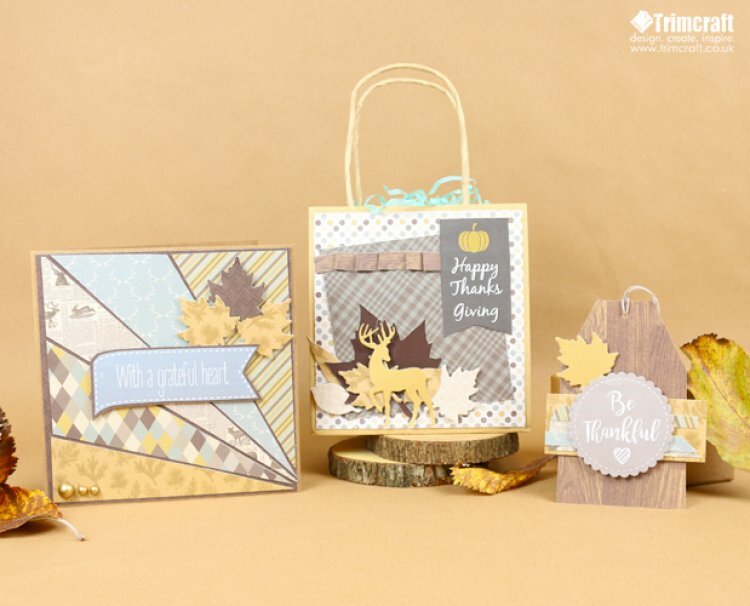 Cut out the ‘Happy Thanksgiving’ topper from your free download and adhere it with Dovecraft Perma Fix tape to the top right of your bag. 6. Next, cut out the leaf from your free topper sheet and stick this to the bottom of your bag. 7. Die cut a selection of leaf designs from the Dovecraft Leaves die set, ensuring to use different paper designs to add interest. Adhere this with 3D foam pads on top of and around your leaf topper. 8. Finish by diecutting the Dovecraft Reindeer die on a contrasting sheet of Wild at Heart paper and layering this on top of the leaf designs, with 3D foam pads. Upcycling bags are the perfect way of personalising a thoughtful gift! With our free toppers, it couldn’t be easier to give your Thanksgiving gift a trendy look! Alternatively you could cut out diagonal strips from a range of Wild at Heart paper designs and adhere them to your card blank. To achieve an autumnal finish, die cut the Dovecraft Leaves dies and add the ‘With a grateful heart’ sentiment topper to the centre. For sweet and simple look, you could cut out a tag shape from the Wild at Hear paper pad and decorate it with layered paper strips, a Dovecraft leaf die cut, and the ‘Be Thankful’ sentiment topper. Whether you’re celebrating Thanksgiving or not, these heartfelt sentiment toppers and designs will add the perfect finishing touch to your handmade projects! We’d love to see your Thanksgiving inspired projects so remember to upload them to the project gallery and to #trimcraft when uploading to social media.